Fr. 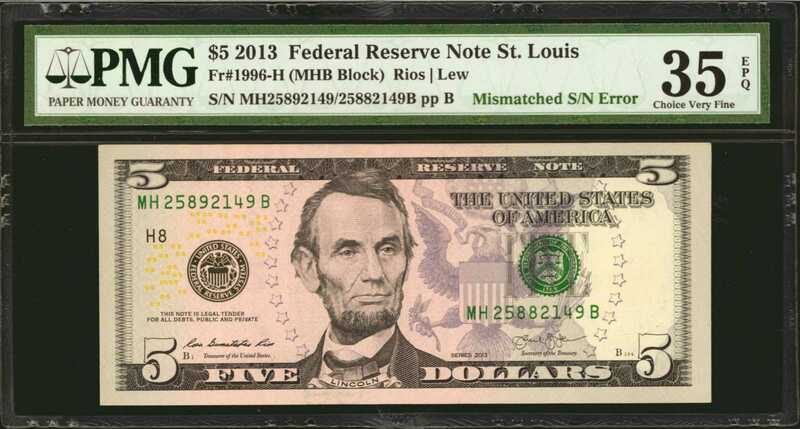 1996-H. 2013 $5 Federal Reserve Note. St. Louis. PMG Choice Very Fine 35 EPQ. Mismatched Serial Number.Colorized errors are highly scarce and typically only small fold overs or other non dramatic errors are found. This mismatch is rare and will certainly enhance any error collection it enters. Shown with a MH25892149B/MH25882149B mismatch.